Locomotive #425 sports a deep blue paint scheme the result of its 1992 paint job inspired by former Reading Company engineer Charles W. Kachel. Originally built for the Gulf Mobile and Northern Railroad back in 1928, the locomotive has gone through many railroads, number and paint colors over the years. A Pacific type light 4-6-2 steam locomotive, she was built to haul passengers on the Gulf Mobile & Northern Railroad which ran lines from Mobile, Alabama north to Jackson, Tennessee. 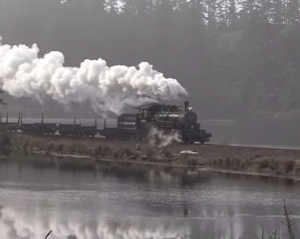 #425 was a Pacific type locomotive that predominately a steam passenger locomotive during her service and was retired in 1950 from the then Gulf Mobile & Ohio Railroad. 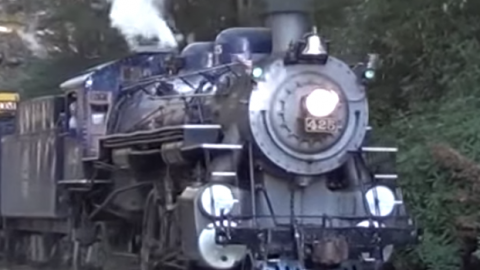 If you’ve ever taken a ride on the Blue Mountain and Northern Railroad (AKA Reading & Northern #425) or a train like this let us know in the comments below! Would love to hear your experience on this classic piece of history!